St. Augustine is a city of firsts. It is recognized as the first colony in the continental U.S. The oldest Christian community began there, and in 1738, it became the site of the first free settlement for ex-slaves at Fort Mose. On July 1st, the city will reach another historical first mile-marker when Jacksonville native Juana Jordan assumes the position of Sr. Pastor at the First United Methodist Church in St. Augustine. Jordan, a graduate of Emory University Candler School of Theology, was ordained as a full elder in 2017. She is in her eighth year as a full-time pastor, five of which she served as Sr. Pastor of Harris Chapel United Methodist Church in Fort Lauderdale before being appointed back home to Jacksonville to plant a new faith community. She spent her first year getting re-acclimated to the area, serving as Pastor-in-Residence at the predominately white Southside United Methodist Church. Senior Pastor, Juana Jordan, First United Methodist Church in St. Augustine. While serving at Southside, Jordan said she felt God begin to solidify her calling to build a multi-ethnic church in the Jacksonville area that would connect the diverse people of God. She and a small core group focused on the La Villa and Old Brooklyn areas of Jacksonville to establish a new church plant. They began with a prayer walk through the area, and Jordan immediately started making contacts which led to a baby shower for a stranger, a community cookout, and later a Christmas party for the area’s children. Pastor Bruce Jones says, “Juana brought to the table passion, creativity, and intimate knowledge of Jacksonville. She grew up here, after all.” Although Jordan worked tirelessly and made fantastic inroads into the community, it was determined that the neighborhood wasn’t established enough to support a new church. Last Spring, the Florida Conference of the United Methodist Church re-assigned her to the 193-year-old church in St. Augustine. “It is a humbling opportunity, that God would pick me,” she noted. The First United Methodist church of St. Augustine, located in the city’s downtown, stands just a few blocks from the open-air pavilion, known as the Plaza de la Constitucion, which was once identified as a slave market. With the English acquisition of Florida in 1763, the plantation system flourished, as did slavery. At the close of the Civil War, nearly 61,000 residents were slaves — roughly half the population. Some may argue that no specific slave market was created in St. Augustine because of the establishment of Fort Mose, but slave sales did occur. The majority of Florida’s plantations owners, such as Zephaniah Kingsley, purchased their slaves in the colonies or directly from Africa. However, because the building was located initially to house goods as they were unloaded from local ships, slaves soon became part of the transactions at that location. 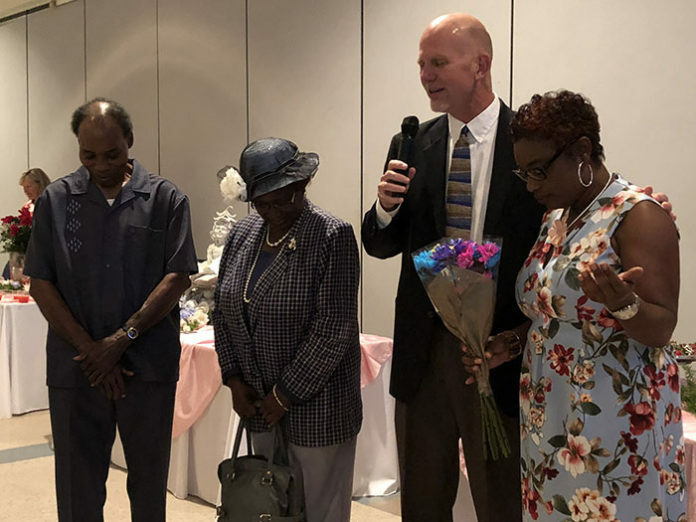 Pastor Bruce Jones says that the congregation at Southside UMC is sad to see Juana go but is eager to support her on her big step. Many members plan to attend Pastor Jordan’s first sermon on July 1st. “We are proud of her and grateful for the opportunity to walk with her on her journey of faith and service,” Jones added. St. Augustine has come a long way and has achieved many milestones. Perhaps now, through continued prayer and with Pastor Jordan’s leadership, a new lighthouse, like the one in Anastasia, will become erected in the heart of the city. This light will beckon the diverse people of God to come and indeed grow into an integrated, supportive family of believers. Lauren Crews hails from the business world as a marketing coordinator and event planner in the pharmaceutical industry, but also had the privileges of being a stay-at-home mother for 13 years. She is currently an 8th grade teacher, author and blogger at www.laurencrews.com. You can follow her @LaurenCrewsA2Z.